Lay-by on the A5093 close to its junction with the A595 (SD 131823). OS Explorer OL6 – The English Lakes - South Western Area. 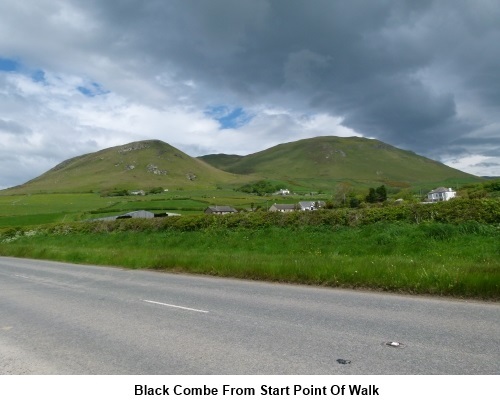 Introduction: A Black Combe walk is a useful walk to have in your list of planned excursions for any trip to the Lake District. “Useful” because set in the furthest, south west corner of the National Park, a little remote from the main fells and close to the sea, it can escape inclement weather affecting other fells, depending of course on which way the weather is going. 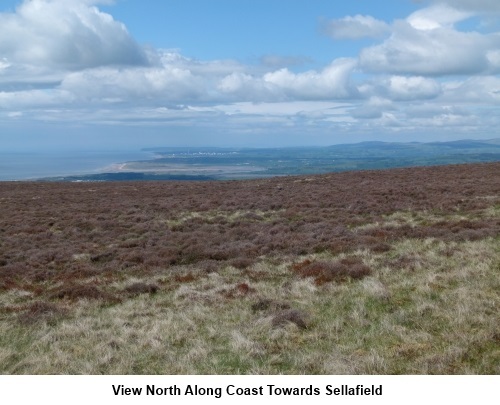 Even many regular Lake District visitors have never heard of Black Combe and the plus point therefore is that even at peak times, you can have at least much of this walk to yourself. At 1970ft (600m), Black Combe falls 30 ft short of being a “mountain” but that is not to disrespect it because as you start virtually at sea level, you have to climb every inch of it. 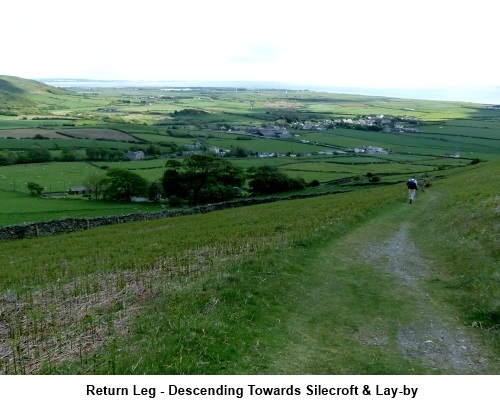 In terms of effort, it therefore requires as much input as some “proper mountains” in the Lake District, where you can start at higher altitudes. 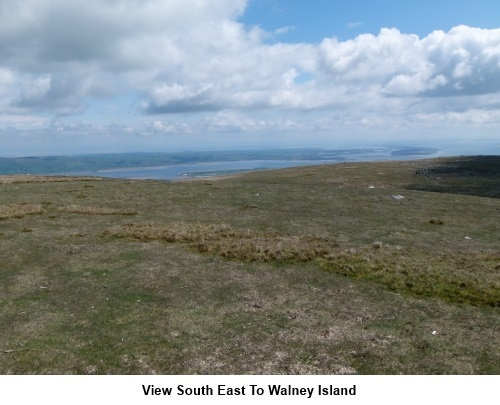 Moreover, the views from its summit north and south along the coast and inland to the main Lake’s fells are superb. The Isle of Man and Scotland are also clearly visible, at least on a clear day. The chances are that even if poor weather obscures the views inland, you will still get good coastal views. As you approach from the east and south, there is a dark coloured corrie (or combe) from which the hill gets its name. There is a multitude of tracks on Black Combe. This is an “Open Access” area and people have obviously made their own way, irrespective of the official Rights of Way (ROW) shown on the OS map. A consequence is that not all the most obvious tracks on the ground correspond with what the maps show as footpaths and in places, the “official” ROW are virtually invisible. 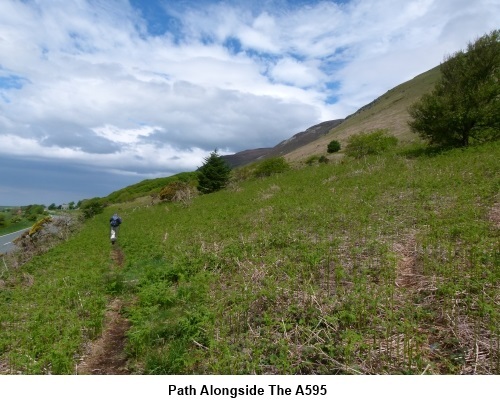 In describing this walk therefore I have paid more attention to the following the most obvious tracks/paths across the Open Access areas that actually exist, rather than trying to slavishly follow the ROW. 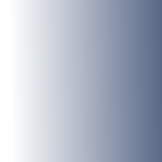 The GPS route corresponds with the route followed. 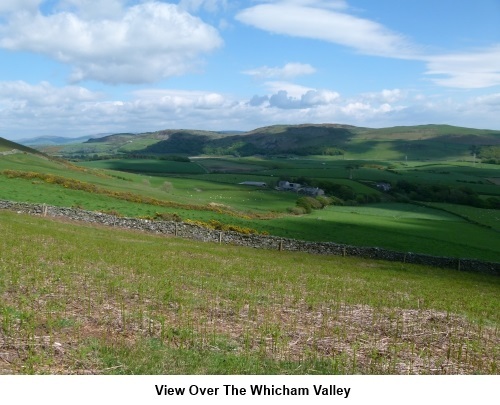 The walk starts from a large lay-by on the A5093 yards from where it meets the A595, just outside the village of Silecroft. Start: Turn right out of the lay-by SD 131823 in the direction of Millom along the A5093 and after a few yards, turn left at a fingerpost for Black Combe. Head for the walkers’ gate in the middle of the right hand side of the field and then turn left up the lane. At the road, go straight across through another walkers’ gate, then bear right to the opposite corners of the next two fields. Exit on to a tarmac drive and turn left. When the drive turns left to the house, go straight ahead on the stony track. 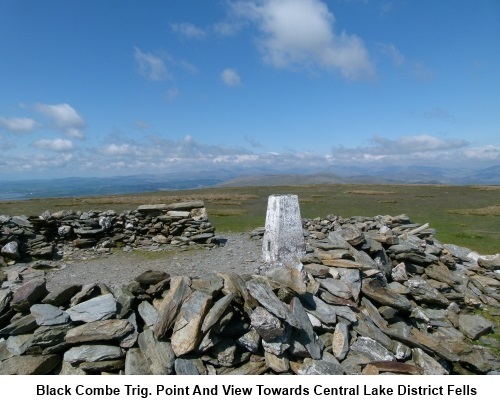 When it splits (SD 131829), the right hand arm signposted for Black Combe, go left for the A595. This is in order to create a circular walk. If you just want a simple “there and back” walk, just follow the very clear path to the summit from this point. Assuming you are following my circular route, follow the path from the finger post and when you get to a bungalow, follow its right hand boundary wall. When the wall starts to descend, take the path to the right. For about half a mile you now walk parallel with the A595, no more than 10 yards from it in places but this is better than walking along the road’s verges as it is fast and quite busy road. Just as the path is about to join the road at a fingerpost (SD122836), turn right to take the path gently climbing and bearing left. At this point you are leaving the “official” ROW shown on the map. Go through a gate and turn left to follow the path behind a small wood and on joining a broader track, turn left. You come to a small valley with a stream at the bottom and you may find your way obstructed by gorse (SD 122841). You may have to head uphill slightly to find a passage through but then head downhill across the stream to the wall. Turn right to follow the wall. You come to a gate with barbed wire on its top and a “no walkers” sign. Bear right to follow the wall. Do not go through the gate. You will soon find yourself on a much wider track. Continue to follow the wall. When the wall turns abruptly left, keep straight ahead. You arrive at another little valley with a dam. Turn left, descend to the farm track and turn right (passing to the left of Whitbeck Mill) (SD 118847), at which point you are back on an “official” bridleway. As you approach a disused quarry and the wall goes off to the left, take the right hand fork, climbing on a grassy track. Pass a more steeply climbing track on the right but ignore this and walk on behind the old quarry. Pass abandoned Fell Cottage at SD 116859. You pass along a little valley with dramatic rocks on the left. 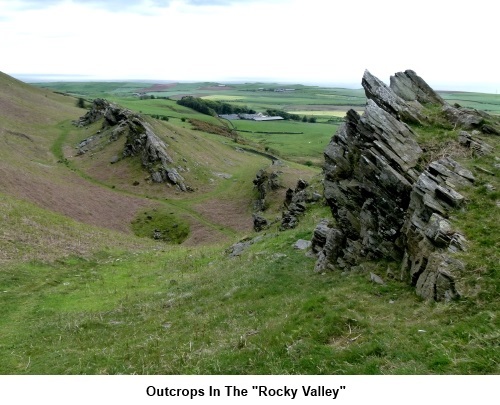 Climb out of the “rocky valley”, ignore the tracks off to the right and bear left down towards the wall. Follow the wall along, crossing two small valleys with streams (SD 116865 and SD 117871). At a corner of the wall, as it bends left at 90°. Your track goes straight on. Just over ¼ mile on from the corner of the wall, the path turns right (SD 120177). Continue on the clear track up to the ridge where it bears right, to follow the ridge along. Stay on this track to a ‘T’ junction (SD 137857) and turn right to take you to the summit and the trig. point (SD 135855) in the centre of a crude shelter and enjoy the 360° view. From the trig. point, head south west towards the sea (243° magnetic). You will soon see a clear broad track descending to the left which is your return route. Follow this down. When the track splits at SD 130836, go left continuing to descend. Keep descending the main track ignoring any minor turns. You will soon catch sight of the lay-by where you started. You meet your outward route at the A595 fingerpost. Turn left and retrace your steps to the car park.